The Dragon Library is a story about the magic in books. 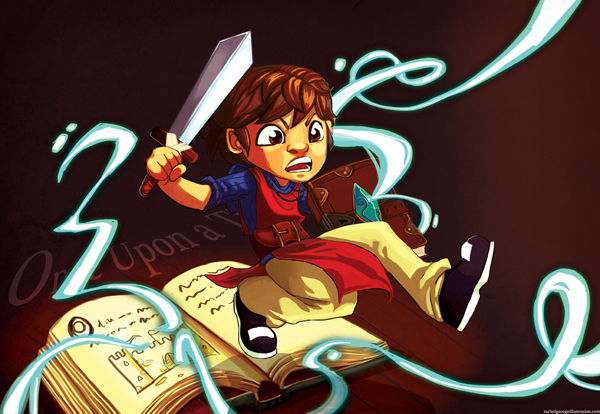 This particular illustration is of Luke, wielding his sword and magical book shield! There’s adventure to be had! Rachel George is a Freelance Illustrator & Designer from Bolton, England. She has been working in the Illustration & Design industry, professionally, since 2007, and a num… Show more. Send a message directly to Rachel George. “Rachel created the front cover for our new title 'House of Vampires', a novel aimed squarely at the teen market. We selected Rachel on the quality of her portfolio and were delighted with the ideas she came up with. She worked to the brief, and also brought her own creative flair to the project. I'd like to work with Rachel again soon and thoroughly recommend her as a supplier.